I'm glad your posting this build here, I'll be watching with a very keen interest. After all I want to know how to put this thing together too. I figure the more examples I have, the braver I'll get. No need to rush(4th) just to stay ahead of me. 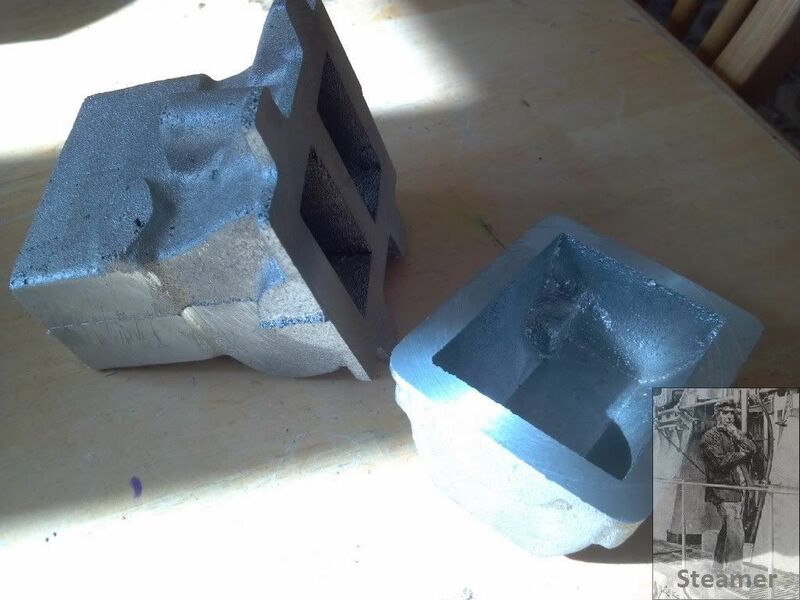 OK I made a start on the block castings by facing the flange to a finished thickness and flat. 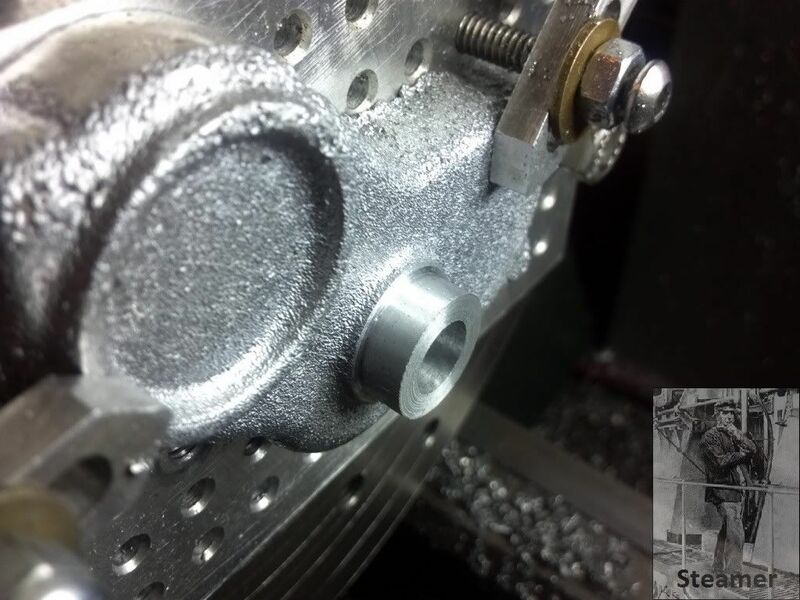 I mounted the block in a 4 jaw chuck and set up the casting so that the flange was an even thickness all the way around. I then set up the sump casting and did the same thing. 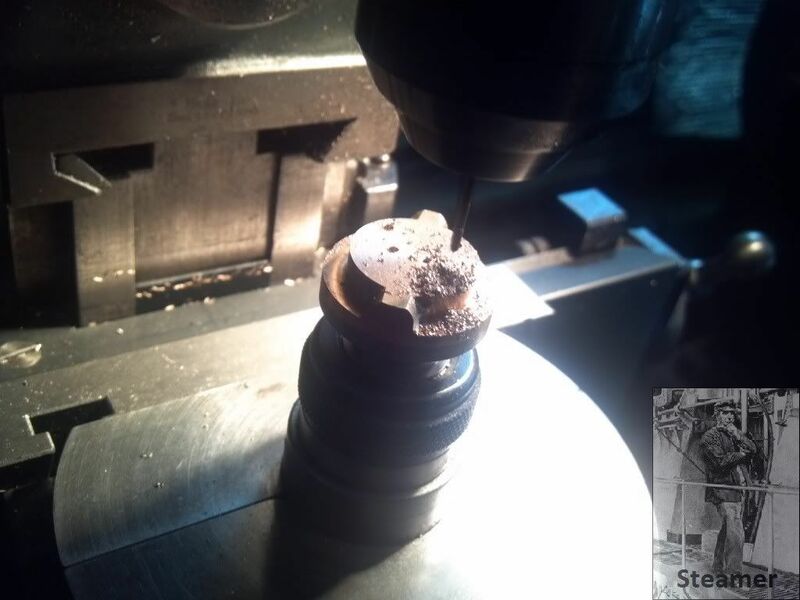 I then faced the top of the block to +.040" by setting it up in the mill and facing it dead parallel to the base flange. 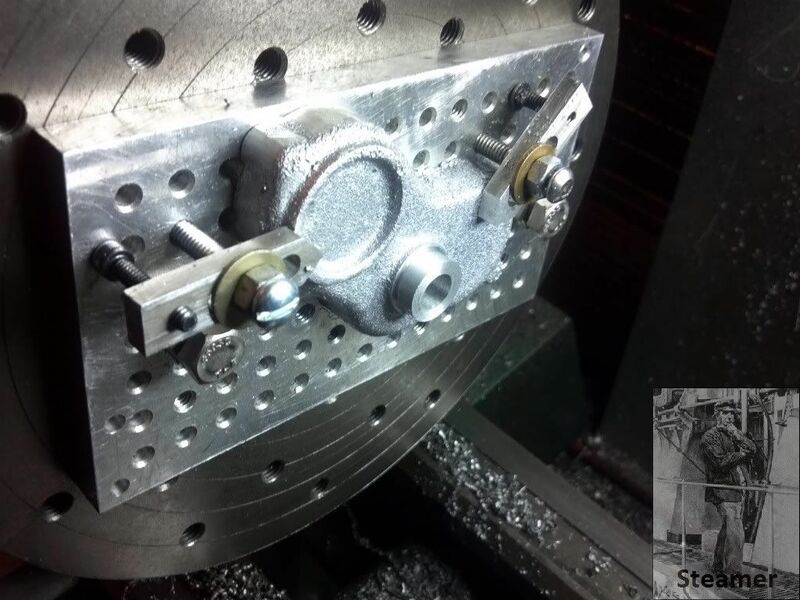 Next came the initial machining of the timing cover. I set the cover up in my lathe on a fixture plate mounted on a faceplate....I love faceplates! I have several of these fixture plates and they are nothing more than a piece of aluminum plate with some holes in them It helps if their squared up as it makes it convienent to shift from machine to machine....but it's nothing fancy by any means. I made the straps too, and the fixing bolts are 1/4-20. After a quick work over with a file to get the back somewhat flat, I mounted this all up and centered the casting boss in the lathe and then proceeded to machine the front boss and bore in one setup. 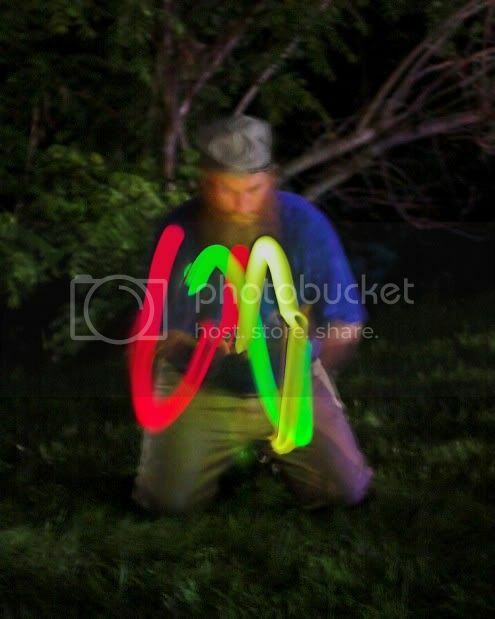 Now I'm approuching these parts this way, because of the picture on the first page of this thread. The Oil pump is WAY over constrained....TOO MANY DATUMS! 3 castings locate the pump in it's entirety.....The most problematic is the gear case cover. 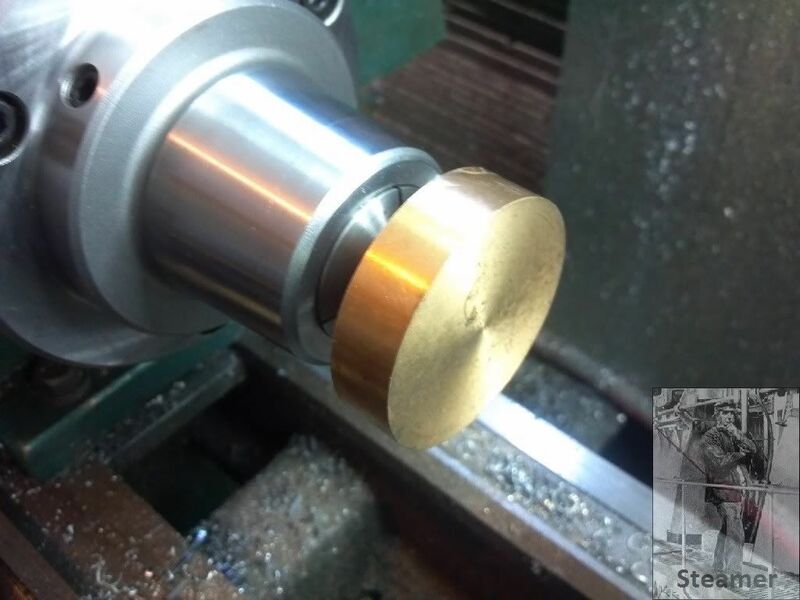 It is fixed by the bushing in the just completed bore that mates with the crankshaft. There is no float there anywhere. It also locates 1 side of the oil pump via an eccentric spigot. The other side of the pump is located by a concentric spigot on the other side of the pump where it's mounted into the sump. This is of course, located by the block!.....YUCK! The only way I can figuire to machine this is to do it all "in situ" using toolmakers buttons I'll offer that I don't have DRO's on any of my machines. The Southbend will get it eventually....but that's another project! Mount the sump and face the ends parallel to eachother and square to the crank. Dismount, and using toolmakers buttons, locate all the various gears in mesh on the front of the block adjusting as I go to get good mesh. Set up on the block and locate the timing case with the crankshaft bushing. Drill and tap the mounting holes for the timing case. Set the block/sump assembly back up on the lathe locating on the cam shaft center. Bore the block for the camshaft bearings. More the block for the idler gear pin. Lightly face the timing case in the area of the pump mount. Sweep the eccentric pump body in on center of the swing of the lathe. Bore the timing case spigot which is now eccentric to the pilot bearing diameter. Tap the final holes in the case. I do not have DRO on my machines either and I will be asking questions about the tool makers buttons this time as I did not quite get it last time around. They look like good castings and IMHO that's half the battle when working with them. 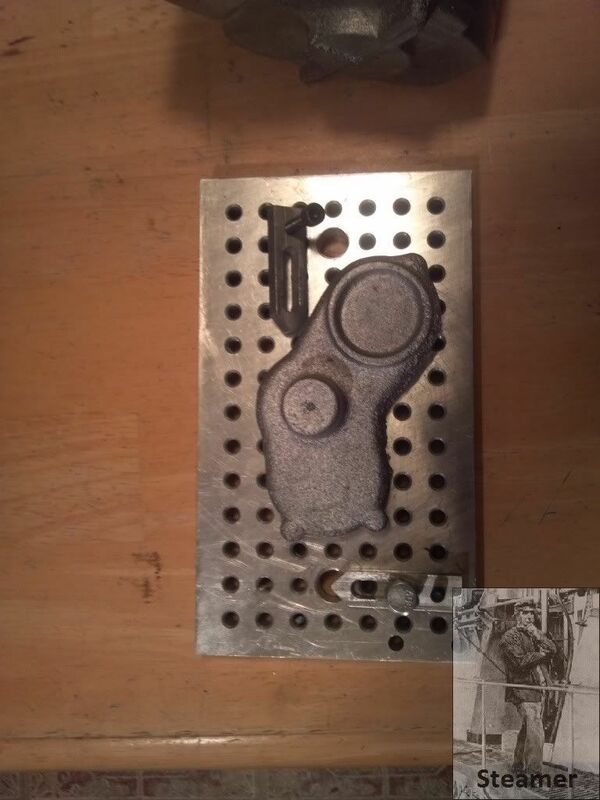 The next item I worked on was the oil pump. This part is made from bar stock and commercial 10 tooth pinions. I started with a simple fixture...Why?....because the only piece of bronze stock I had the right size was very short. So I faced and counterbored to the 7/8 dimension and then mounted the piece to glue chuck. I then brazed the bosses on and cleaned it up in the mill. And then put the various holes in for the screws as well as tapped holes for the toolmakers bushings. NOW we need to bore the holes for the gears. To be efficient, the fit here needs to be pretty good! My mills don't have quils, so boring with them is kinda problematic. 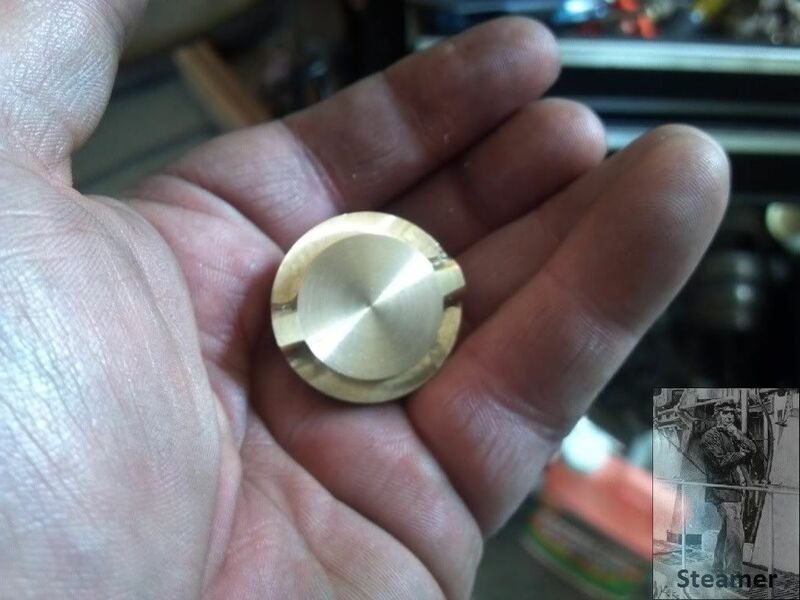 I did this in the lathe....but how do we position on the faceplate? This is a very old device and if used carefully, can be very accurate. They are used to establish a position on a piece, and then indicate that position so that it is coincident with the axis of rotation of the lathe. This is determined using a dial indicator. 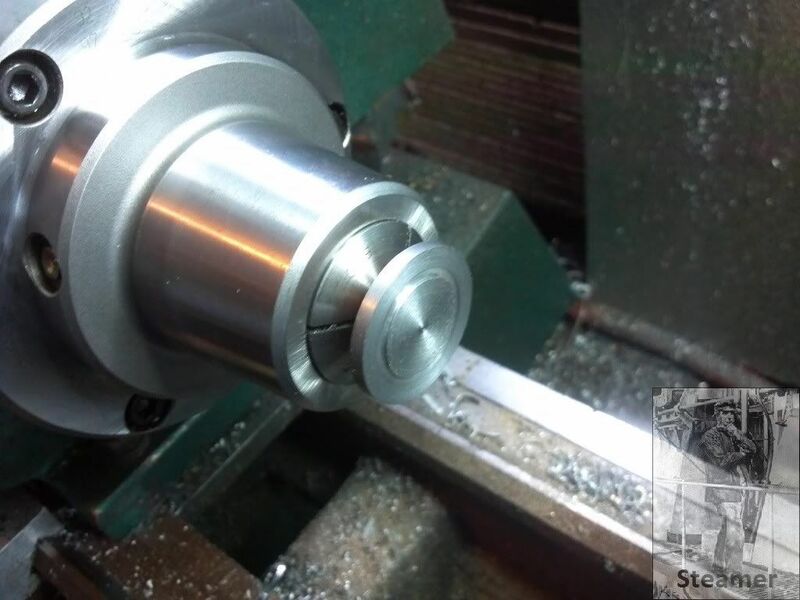 A pair of tapped holes is put into the work piece as close as you reasonably can. The bushings are then clamped to the piece at these locations. 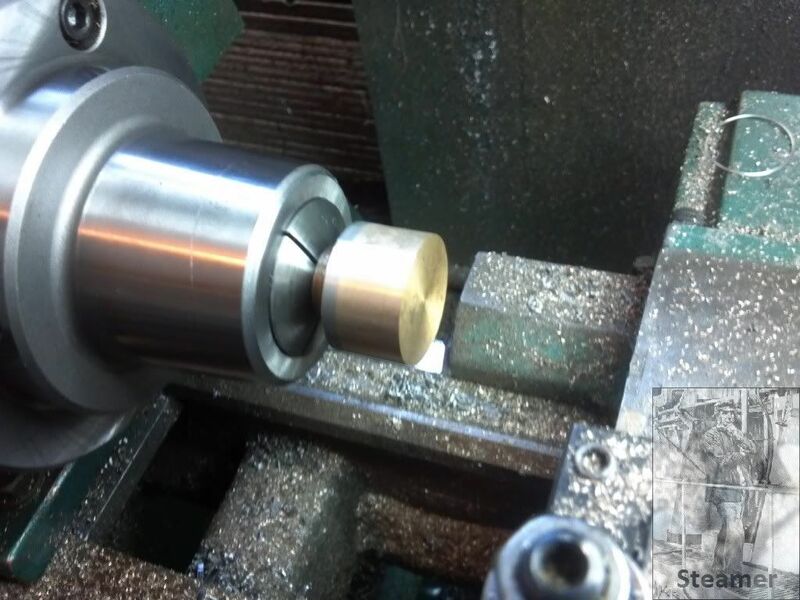 Because the center hole is much bigger than the screw clamping it in position, you can move the bushing around a bit. 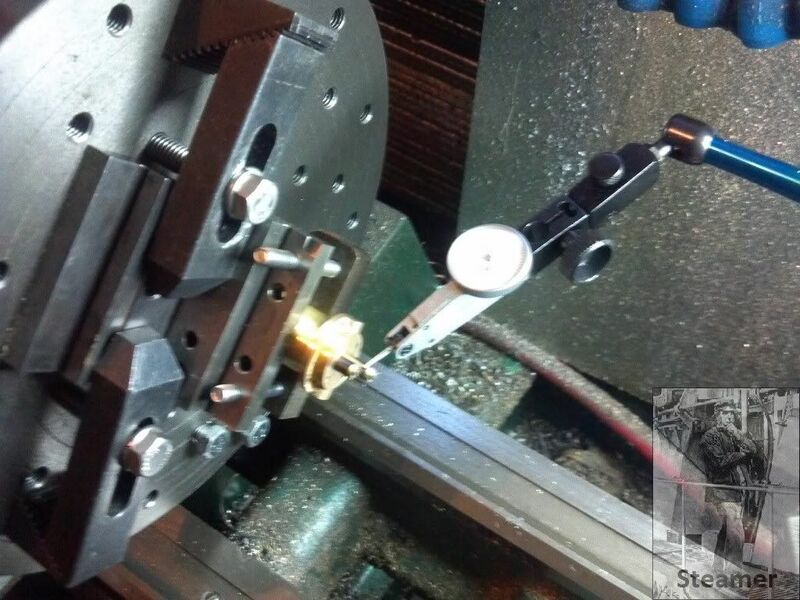 This feature is what we will use to position the bushing EXACTLY where you want them, using a micrometer, and a surface plate to finely position these bushings. In this case I used a angle plate with a V in it to hang on to the embryonic front pump housing. I did this so I can bore the two pieces in one set up there by making the shaft bore and the gear bore dead concentric. 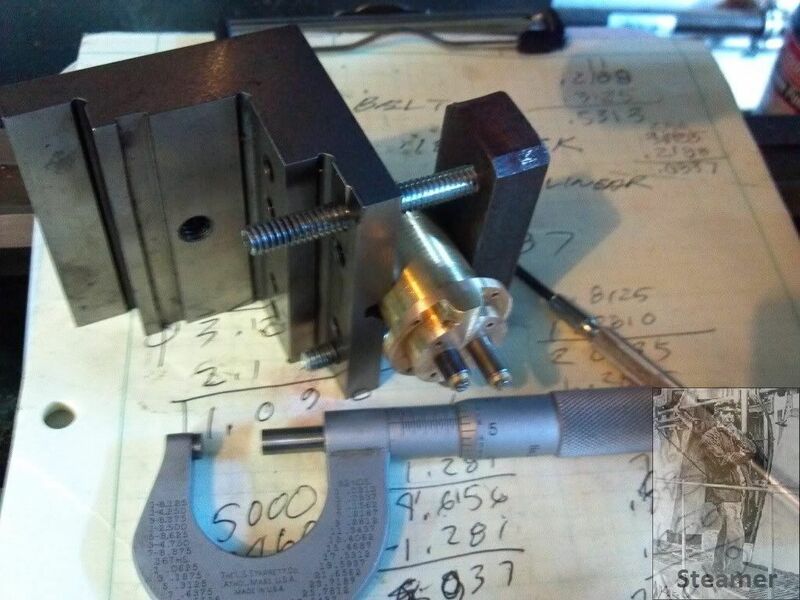 Using the micrometer, I set the distance between the bushings to exactly 3/8". I then put the angle plate on the surface plate and using a dial indicator, rotated the assembly until the two bushings were parallel to the plate. You can see the longer bushing in the photo above. OK so now, I fixed the angle plate to the faceplate and bumped it around a bit until the I got a zero reading on the dial indicator. 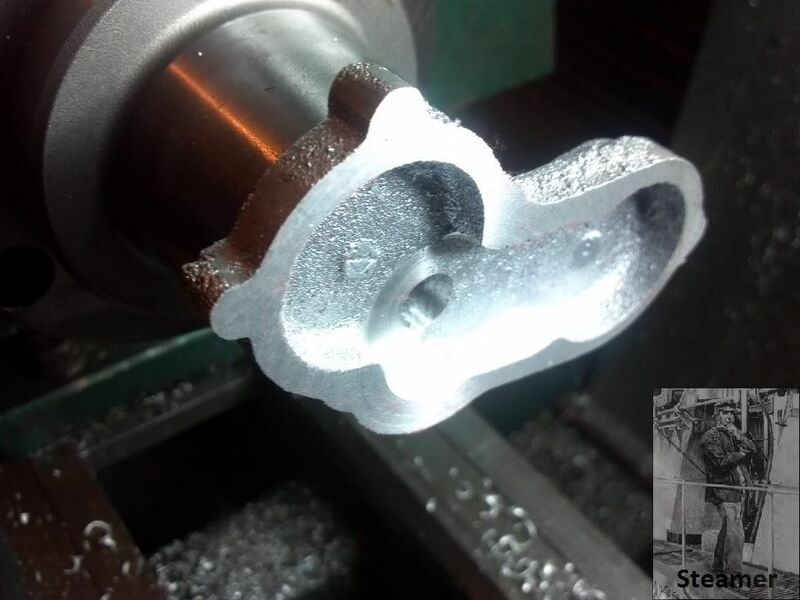 Once located, remove the centered bushing and proceed to machine the feature. LEAVE THE OTHER BUSHING IN PLACE AND UNDISTURBED! Then I bored the pump shaft in the housing, and bored the case for the gear in the same set up. 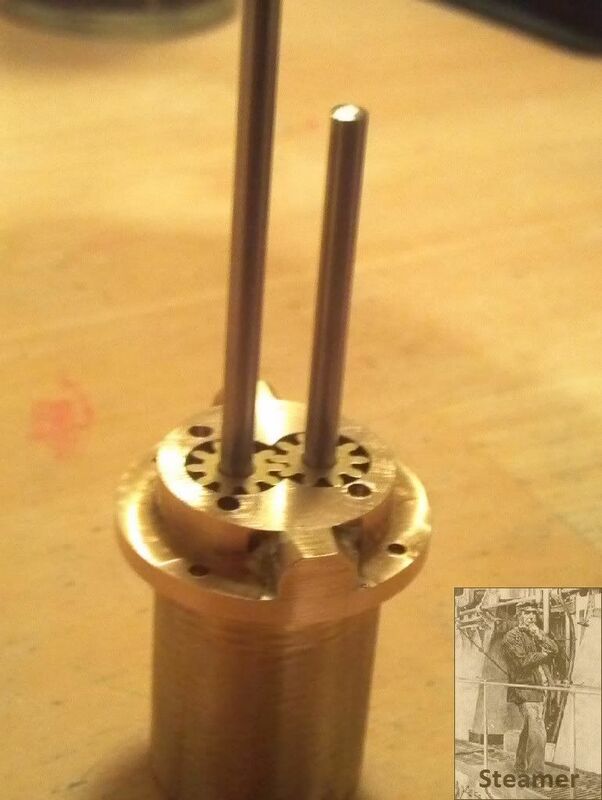 I finished the shaft diameter with a toolmakers reamer after the 1/8 inch bore was drilled and then bored undersize, and then finished to size with the reamer. You have no choice with the 3/8 bore but to bore it to size. 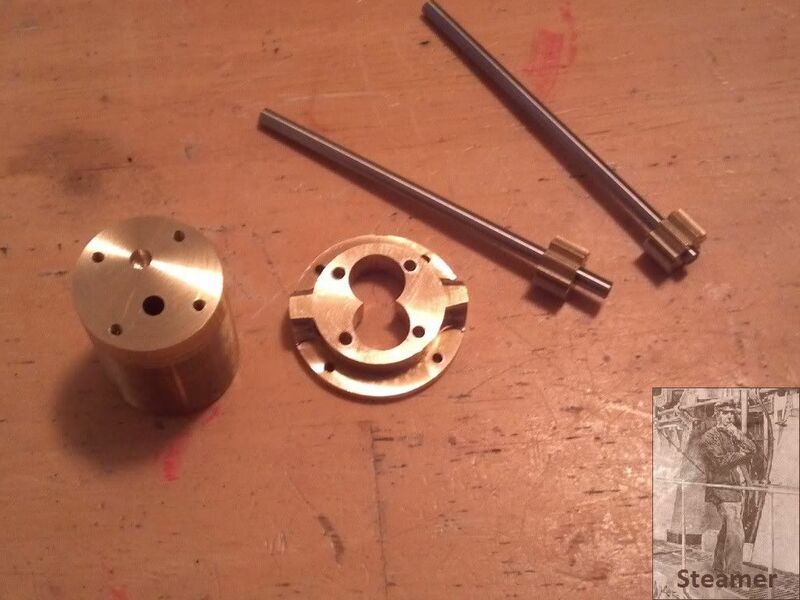 Once complete, I moved the angle plate to sweep in the other bushing, and machined for the idler shaft and gear. Next I removed the gear housing only and did a very light facing cut on the front housing. Next I finished the front housing. Thanks for the detail about the toolmakers bushings now I get it. YUP! Now that you know...the men in the black suites will be over! She's a sweetheart....and is way out of my league....but I was in the right place at the right time.....at a SWEET price.....the money damn near caught fire on the way out of my pocket! Will you be building to the Articles or Hemingway's plans? I'm building to the article......like what? looks like it has a bush for the timing cover rather than a oil throw, if so id just like to say the oil throw seems to work very well and oil leaks are far more likely on the pressurised side of the oil pump. I had to use plumbers tape on all my fittings especially on the pressurised side but there was no sign of a leak from the throw. "the money damn near caught fire on the way out of my pocket! " this build is shaping up very nicely, thanks dave. Thanks for the interest and support.....I felt like )($(*$ yesterday...maybe I can get some shop time today. Bad Behavior has blocked 14611 access attempts in the last 7 days.